I'm posting this recipe for discussion as we have been talking about it on the Glezer firm starter thread. I have made this bread often with variations because I did not have the high-extraction flour yet. I recently purchased the Golden Buffalo flour from Heartland Mill in Kansas and it was superb. I didn’t take photos of those so will next time I make it. The one pictured here was made using Hodgson Mill WW graham flour sifted for the WW portion (250g) and mixed with the 750g King Arthur bread flour. I’ve also made it sifting the King Arthur traditional and organic WW flours but I like the sweetness of the graham flour. Still, I think after using that high-extraction flour the flavor was so extraordinary I would choose to make it that way more often. Mountaindog has also posted her variation on this bread here and she makes beautiful loaves of it. This is a great recipe to play around with and it always comes out fabulous bread. Another note – I generally like to make four smaller boules but when I made them with the high-extraction flour I made two boules and they were large and fantastic. 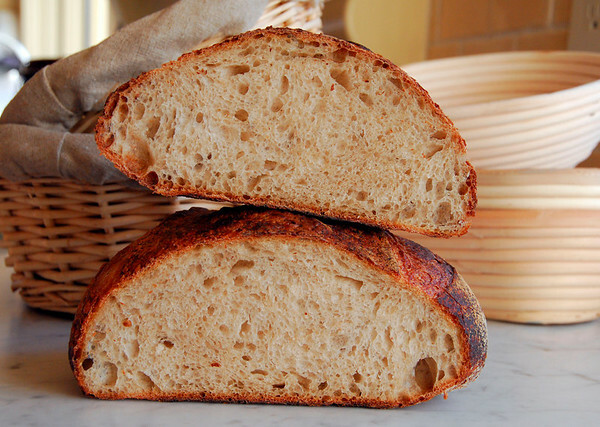 Much of what makes this bread so special is the high-extraction flour used in it. This is a bolted whole-wheat flour much lighter in color and sweeter in flavor than a whole-wheat flour (at 100% extraction), but much darker and more flavorful than a white flour (at 72% extraction). The method I give here for making your own high-extraction flour will work best on coarsely ground whole wheat flour. If you already have a good high-extraction flour, substitute it for the whole-wheat and bread flour in the final recipe. Thom also includes a little of his sourdough rye starter in the dough, but it is such a small amount that I have bumped up the levain slightly and added rye flour to the final dough instead. Dissolve the sourdough starter in the water in a small bowl. Add the flour and beat this batter-like dough until very smooth. Place in a covered container and let it ferment overnight for 8 hours, or until fully risen and just starting to sink in the middle. Sift the whole-wheat through your finest sieve or flour sifter. The large flakes of bran should be caught in the sieve (use them for flouring your peel or for muffins). Measure out 2 cups 3 tablespoons (8.8 ounces, 250 grams) sifted flour. Mix this dark flour with the bread flour and the rye flour in a large bowl or in the work bowl of your mixer. By hand: Pour the watered levain into the flours and stir with your hands or a wooden spoon just until a rough dough forms. Turn the dough out onto the unfloured work surface and continue kneading until the dough is very smooth and shiny, about 10 minutes. This is a lot of dough and will take some muscle. Sprinkle on the salt and continue to knead the bread until the salt has fully dissolved and the dough is very smooth and shiny. By stand mixer: Add the watered levain to the flours in the work bowl and stir the dough together with a wooden spoon or your hand (this will make the mixing go more quickly). Using the dough hook, mix the dough on medium speed for about 10 to 15 minutes, or until the dough is very smooth and almost cleans the bowl. Add the salt and continue mixing until the dough is much tighter and cleans the bowl, about 5 more minutes. This should be a soft, sticky, and extensible dough. Place the dough in a container at least 3 times its size and cover it tightly with plastic wrap. Let it ferment until it is airy and well expanded but not yet double in bulk, about 3 hours. Turn the dough 3 times at 30-minute intervals, that is, after 30, 60, and 90 minutes of fermenting, then leave the dough undisturbed for the remaining time. Flour the surface of the dough and your work surface and turn the dough out. Tuck the edges of the dough in to tighten it, round it, and cover it loosely with plastic wrap. Let it rest until well relaxed, 10 to 15 minutes. While the dough is resting, sift flour over a linen-lined basket or line a large colander with a well-floured tea towel. Shape the dough into an even and tight round loaf without deflating it. Place the dough topside down in a linen-lined basket or large colander, lightly sprinkle it with flour, and cover it well with plastic wrap. Proof the dough until it is well expanded, about doubled in volume and remains indented when lightly pressed with a floured finger, after about 4 hours. At least 45 minutes before the dough is fully proofed, arrange a rack on the oven’s second-to-top shelf and place a baking stone on it. Clear away all racks above the one being used Preheat the oven to 450°F (230°C). If desired, just before baking the bread, fill the oven with steam. Turn the bread out onto a sheet of parchment paper or a floured peel and slash 3 to 4 diagonal slashes and 3 to 4 horizontal slashes into the top. It will look like a skewed grid with diamond-shaped openings. Slide the bread, still on the paper, onto the hot stone and bake until the bread is dark and evenly browned all around and sounds hollow when thumped on the bottom, 70 to 80 minutes, rotating it halfway into the bake. If the bread is browning too quickly, reduce the oven temperature to 400°F (205°C), but still bake the bread for at least 70 minutes. Let the bread cool on a rack. Zolablue those are beautiful loaves! Thank you so much for posting your version of the recipe. After reading it over I was quite amazed to see how long you knead the dough in the mixer. For yeasted dough I find usually I get good results with a good long knead, but for sourdough I thought less was better. Did the shaped dough really take about 4 hours to double? I'll be trying this recipe in a day or 2, so stay tuned for results. This is Maggie Glezer's actual recipe from the book. My version only included the WW graham I used, sifted, when I did not have the high-extraction flour. The WW graham I use is quite coarse so it was easier to sift and added a nice flavor. During winter, when I made this bread it took all the time called for and sometimes more. I'm sure at times I had to wait up to 6 hours instead of the 4 hours due to the colder temps. If I remember correctly Mountaindog experienced the same thing. Again, with sourdough, you wait on it and not the other way around. During warmer months it goes much quicker so just keep your eye on it and watch how it likes to act. Notice Glezer states not to allow the dough to double either; as she says, "well expanded but not quite double." 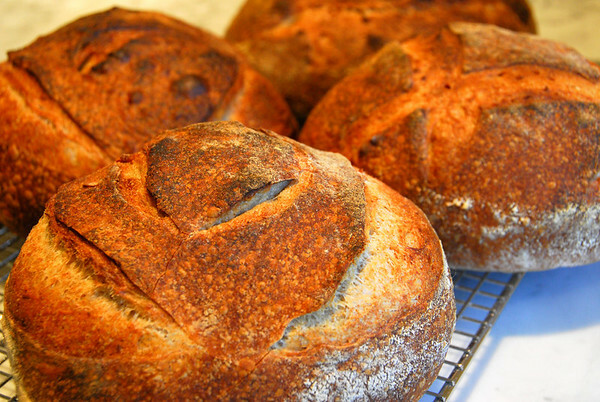 Whatever you do you can't make bad bread with this recipe. And if you can't get the high-extraction flour please follow Mountaindog's formula as she has it down. Or just experiment so you get a loaf that comes out according to your taste. I made that recipe this weekend too. I've been making the columbia most of the time, and thought I'd try another levain bread this week. One silly thing about the recipe, I glanced at the first sentence rising times and completely missed the turns. Of course it was my own fault, but I grumbled that the recipe should have read -- "Let rise for 30 minutes, turn.... for a total of 3 hours". Just for those of us who are chronic recipe skimmers, ha ha. I made this recipe again, this time I'd planned to use the Golden Buffalo high-extractionn flour but alas I had a brain phart and grabbed my bag of Wheat Montana Prairie Gold by mistake. Doy! All day I was so excited and happily working away. It was not until I shaped the loaves for final proof that I noticed the "hard to miss" large letters on the bag that read Wheat Montana and discovered my error. Oh well. Luckily, while I would probably not repeat this version using almost 100% Prairie Gold, which is not a high-exraction flour, the flavor was quite good. The crumb was much more dense than previous times I've baked this bread but very moist and very flavorful. It all turned out to be a happy little accident because my first experience using the Prairie Gold had left me less than impressed. It is amazing how lttle changes to a bread recipe can yield such different results. Now I'm on to making this again using the Golden Buffalo that produced such incredible loaves the first time I tried it. I hope I will be able to post photos of those. Loved your photos and the detailed write-ups, as always. I did a version recently, following one of your suggestions, with Golden Buffalo flour from Heartland Mills, a "high extraction flour", which I thought tasted great and resulted in a nice loaf. I did the levain with the same Golden Buffalo flour. I had a shaping problem and got one of those "lazy baker holes" on the side. Other than that it was a wonderful bread for me. Here are a few photos of my attempts - not as pretty as the ones above. I did a second version where I made the levain with 50% spelt, 20% whole rye, and 30% Golden Buffalo. I have always liked spelt starters in my miche attempts, and I felt this variation tasted great, for what it's worth. Again, a few photos included, also not as pretty as the ones above. You know I love your recipes and those huge boules you bake are just fantastic. You are really pullin some beautiful loaves out of that great new brick oven. And your progress photos are so helpful. I don't know how you get that done with flour and dough all over your hands through the steps. I must try harder to do that with my breads as it means a lot to see the texture of doughs and the various stages. I have been planning to make Thom Leonard using the Golden Buffalo, the high-extraction, as you know, the recipe wants. I have only made it the one time since buying the Heartland Mill flour but I loved everything about it. Unfortunately I did not get photos of that version so I definitely want to repeat it. But I love your sourdough pagnotta so much, which has become a staple for us, so I think I'll plan to make one of your miche recipes first. Can't wait but it will not be until later this week. I have Thom Leonard's, The Bread Book (1990), that I bought a few months ago in hopes I would find some recipes in it that would be fun to make. I really need to give that little book a good read. In the meantime, anyone who takes a stab at this wonderful bread, please feel free to report about your results and, by all means, post your lovely pictures on this thread. The more, the merrier! Now that you've got me going with the TL-CF, I'm curious to check out that book. I probably would like it, since I like this style of bread so much. Not sure Bill as I haven't read it yet. It is a very tiny paperback and flipping through it looks like there are not many recipes and I'm pretty sure he was using a different type of sourdough levain than he does in the Glezer book recipe. So I think he has much updated his methods and recipes. I only wanted it because, hey, it is Thom Leonard! He does give instructions for building your own backyard brick oven! Oh, but then you don't need that. (hehe) I'm hoping, when I finally take time to read it, to find some helpful info but I'm not sure it is a must have. It will only cost you one million dollars! (Ala Austin Powers...hehe.) Ok, just kidding! Sure, I'm flattered and thanks for asking. Here's a couple of pics of Thom Leonard's country french. I had some issues with it. It was very sticky and hard to handle. It was a little under proofed, because of time constraints (I had pizzas to go in the oven for supper). When I took it out of the proofing basket, it spread out like a pancake. I thought I was going to have to throw it out, but I kept my cool and slowly and gently formed it back into a boule. Also, the proofing cloth stuck to the dough, but I was able to get it free finally. All of this for a loaf of bread...the things we will go through. After all of that, I think the loaf turned out pretty good. Better than expected. The flavor was very good, with a moist chewy crumb, and slight sour flavor. I also had the same problem with the sourdough I made these weekend. I'm just starting to play around with slack doughs. I get misled by the great rise I get while proofing. I have to remember to do some folds. I folded my 2nd loaf and it made quite a difference. Chad, your bread turned out great! Ah, yes, the things we do for our bread. But it is sure a fun way to spend time and you always get a treat at the end. I wonder what flour you used? Thanks so much for posting your results! Lovely loaves, one can almost smell them! Thanks for sharing your loaves with us! Thanks for the recipe. This is the first recipe I've used where my outcome duplicates the original outcome exactly. I've cut the ingredients in half (except the levain which I reduced)and it works out perfectly. I made one loaf Sat. and was so pleased that I made another today and ordered Thom Leonard's book. BTW, I only halved the recipe because my bannetons are not large enough for the original recipe. What size banneton would work best for the original recipe?